DisabilityTechDad: "If only I could see what he's seeing"
"If only I could see what he's seeing"
This week Macsen and I took a big leap! We started the transition from games to communication!!! We've been playing EyeFX and LookToLearn games to death for the last year. These have been awesome, but our goal has always been to transition to Communicator, so we can get Macsen Talking! I discussed this with lots of people in recent months and everyone's advice was the same: MAKE IT FUN! 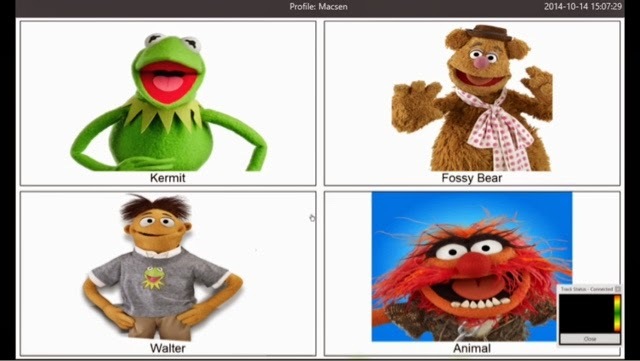 It was obvious where best to start for Macsen: a soundboard of his favourite movie: The Muppets. I quickly created a page in Communicator with clear images and short clips from the movie that Macsen would recognise. When we tried it I was happy; Macsen hit all the buttons, was smiling, but I couldn't be sure whether the actions were conscious or accidental... Luckily I'd started the Gaze Viewer recording before we started! This blog will show you the video and what I quickly learnt about what Macsen had done! 1. To start Macsen wasn't very interested and wouldn't event look at the screen... Until I said I was going to choose my favourite! 2. He instantly engaged with the screen (I'm sure to beat me to it). He was making selections, but the pattern seemed random. I think he was excited to be hearing the muppets talk, but his actions were not intentional at this point. That is until he found Animal! 3. Animal sparked interest.. Animal is different to the other 3; he doesn't just talk, he plays part of a tune... Macsen fel across Animal 2 or 3 times and was clearly excited... If I'm honest, so was I! I started to tap his tray, which Macsen really responded to... Macsen started bang the tray and kept his gaze for a long time (plays the tune on loop). You can see this below with the long line of red blobs and the two clear eye dots in the viewer! 4. From this point on his accuracy improved. He was really looking at the characters with excellent accuracy! 5. He got tired and bored and wanted to go back to his games :). I am so glad that I turned on the gaze viewer. It has given me such an insite into how Macsen is using the system and how he is developing. Without this I would have still been happy to see him engaging, but would have had a nagging doubt... I now know what he's seeing!